There’s no phone and no reservations — and no tables, for that matter — at Freddy’s. 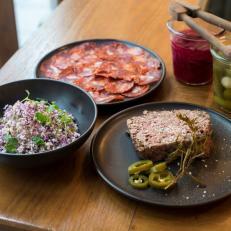 Grab a stool and slide up to the counter for small plates and excellent biodynamic wines. It’s a casual place to sip and snack at leisure, with more creative offerings than your standard wine-bar fare, with dishes like addictive soy-soaked mushrooms, garlicky escargot risotto balls and even duck hearts. It’s a tiny sliver of a space, so come in a small group or, even better, alone.